The Newton 5 is a 5kw steel multifuel stove by British manufacturer Trianco and is priced at £886 (or £1085 for the enamel version). I have one of these in my house (Julian) and am pleased with its contemporary aesthetics and high quality. Newton also sell these stoves to another company and they are sold under a different brand name (Mendip Stoves). The stove is of high quality and the steel is thick. The Newton 5 weighs in at 65kg. The shiny bits are Sheffield stainless steel. 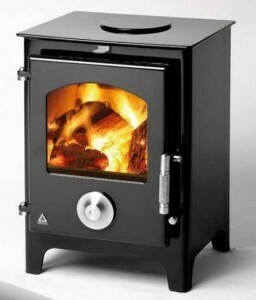 The firebox allows for a 28cm log and is of a good size for a 5KW output. The primary air control works well – but can get too hot too touch if in the closed position (i.e. turned clockwise until touching the stove). Obviously one can wear gloves (and the chrome wheel has a small slot in the centre that the handle of the ash-pan handle can be inserted into if you don’t wish to put gloves on). The Newton 5 is available in various enamel colours: Pewter, Royal Blue, Jet Black, Claret, Cream, British Racing Green. The Newton 5 can be used to burn wood in a smoke control area and can be fitted to a 5″ liner. Efficiency is a respectable 78.9%. Summary: British and well made, good firebox size, good range of enamel colours.